A Request: Corn and Cherry Tomato Salad… and a great chicken recipe too! | Izzy have you eaten? Jemma’s coming to the end of her visit. The weather has not been the best- horizontal sleet, slush on the roads and freezing temperatures. Where’s all the fluffy snowflakes, bright sunny days and inches of white snow we experienced last year? Being the unstoppable gal she is, she’s managed to pack quite a lot in despite the bleak weather. I’ve been clearing out cupboards and cooking: what else to do when you don’t want to be out in all that mess? There’s a Vindaloo on the stove right now, but as it slow cooks, I thought I’d write down the recipe of the corn and cherry tomato salad you’d requested. You know how its done: I guess you just want to see it to be sure you aren’t missing anything. I also cooked a chicken dish inspired from Anna Gare’s book again. It is so dead simple, but utterly delicious ( she’s amazing why had I not heard of her before?? Thank you, Tasha, for the introduction!). You would really like it with your salad I think, so here’s the recipe for both. Put the corn in a pot of salted water and bring to the boil. Once the pot is boiling, cook for about three minutes, but not much more, to retain a nice firmness of the corn kernels. While still warm, slide a sharp knife down the length of the corn cobs to obtain your fresh kernels. In a salad bowl, add all ingredients, except the lemon, oil and pine nuts. Toss the ingredients together with a little good olive oil, some lemon juice to taste, and lastly, sprinkle over the pine nuts. Delicious! Now for that stunningly simple and delicious chicken recipe, Izzy! Flatten each piece of chicken on both sides with the back of a heavy knife. Place the pieces in a shallow bowl, pour over the citrus juice and mix well with a fork. In another bowl, put all the other dry spices and herbs together and mix well. Heat a very small amount of oil in a non stick pan, about a tablespoon. Press individual pieces of chicken into the spice mix, coat on both sides. Shallow fry for about 10 to 12 minutes each side. Alternatively, you could grill the chicken pieces. Serve with a dollop of yoghurt, and a side of salad. 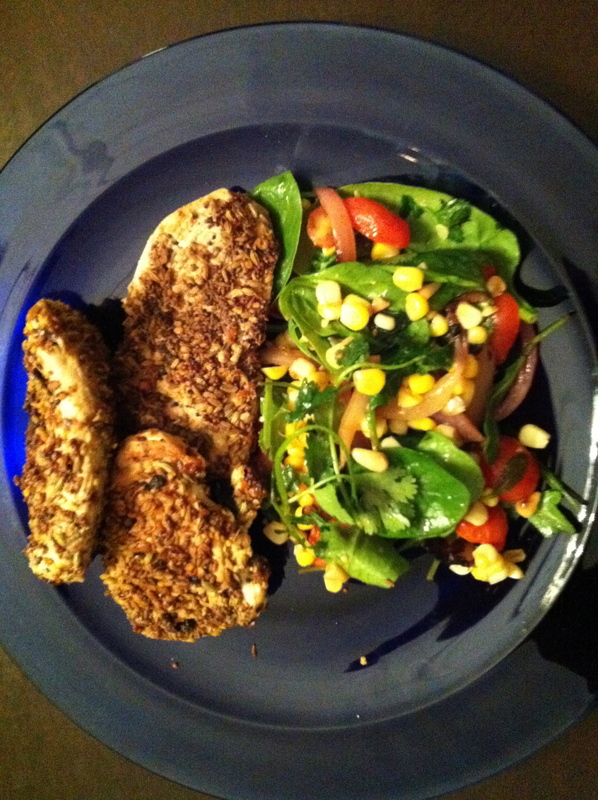 This entry was posted in GROUP C, Uncategorized and tagged Cherry Tomato, Corn, Creole Chicken by tgb9593. Bookmark the permalink.